"We've got some special activities planned," Beck tells the audience. Somehow, even after 6 months of touring through 1996, the 1997 shows stepped UP the energy. (And 1996 wasn't too shabby!) A hyper "Lord Only Knows" is cool; in fact many of the songs sound a bit sped up and hyper. Never my personal favorite on stage, tonight's "Derelict" is pretty impressive. Beck's long acoustic set (8 songs! Though he stops one after one line.) is quite noteworthy, from rare songs never heard before or since ("See Your Face"), to reinterpretations ("Ozzy"), to ad-libbed songs about Eugene, to blues covers ("Grinnin' In Your Face"), Beck throws it all in there. 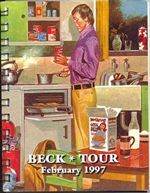 In a strange mix of music allusions, Beck says "we come higher than a boy's choir" before singing a line of Color Me Badd, playing "Thunder Peel" and then singing "So Long, It's Been Good To Know Yuh" before a particularly heavy "Mutherfuker." So that goes from R&B to rock to folk to punk all in quickfire!